I’m currently trying out All Organics’ Hair Butter. I love All Organics’ Jojoba oil, and it’s almost natural for me to try out their other products. I recently just started with this hair butter. My first impression is that it’s delicate smell is inviting. I also love that it’s not very greasy. My hair definitely needs some pampering especially after I’ve seen some ends splitting here and there. I can’t say much yet, I just started using it. I grabbed a hold of this Hair Butter and Rosehip Cream (All Organics) from Summit Ridge Hotel in Tagaytay as I went to do my first themed shots for Canon’s Photo Marathon today. For the record, this hotel has the friendliest staff. They accommodated us without fuss when we asked permission if we could get to their roof top to do some overlooking shots. It wasn’t the same from at least a couple of hotels we went to before that. You have to understand that we’re all geared up (ID, shirts, visors and all), official participants of the Photo Marathon and for people to come in their facility, even for this, is actually an opportunity to introduce people to their hotel and service. But it was fine even if the other hotels were fussy about it, because it turned out Summit Ridge has the best spot anyway. That deserves a post of its own for later in my ReviewsCorner.org page. This blend of hair-friendly oils and butters promote general hair health for all hair types. This creamy butter softens the hair, minimizes breakage, and conditions, making it a perfect choice for the whole family. – protection from sun and sea and chlorine before hitting the beach or pool. Available in 20gms and 100gms. 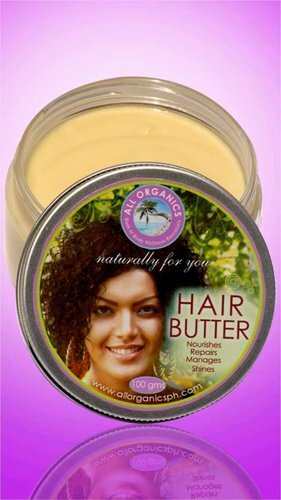 I used to go to Sonia’s Garden or Bag O Beans to get this product (Hair Butter, by allorganics). Last time I went to Tagaytay, it was no longer being sold in those place. Can anyone tell where to find it? I live in New Manila.